Neutrogena coupon is a printable coupon. Summer is here and it’s definitely nice to get out and to the beach. Before you go out, remember to apply sunscreen. You don’t want to come back sunburnt. Neutrogena coupon is available at HealthyEssentials.ca. You have to visit their site, create an account, select the coupons you want to print and you can print them at home. Make sure the retailer you visit accepts printed coupons. Some smaller retailers don’t accept. I’ve been to large retailers such as Walmart and Loblaws and they accepted my printed coupons. Neutrogena coupon is to save $5 when you purchase any two (2) NEUTROGENA Sun Care products. 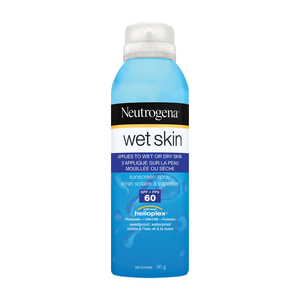 Neutrogena Wet Skin Sunscreen spray is specially developed spray lotion with an exclusive technology that is designed to cut through water to form a protective layer on your skin. It can be applied directly to wet or sweaty skin, as well as to dry skin. Formulated with HELIOPLEX® technology, this sunscreen provides photostable broad-spectrum UVA/UVB protection. Available in SPF 30, 60 and Kids SPF 60.